Tonight’s challenge is to change ground turkey into something that tastes like a meaty sauce. The answer is mushrooms. After browning the ground turkey (and by browning I mean making the turkey white instead of pink), I saute mushrooms which I have chopped in the food processor until they are about the same size as the meat pieces. It’s important to get the mushrooms dry during this step. Add onions, garlic, tomato paste, chile flakes, and spices and deglaze the pan with some white wine. Then put in the tomatoes and spaghetti sauce (mea culpa I didn’t totally make the sauce) and simmer for a while. Along the way season each step with salt and pepper. At the end adjust the seasoning with soy sauce for a boost in umami flavor . I make a big pot of this and refrigerator/freeze half for another dinner. No, it doesn’t taste like a ground beef sauce but it’s pretty good and gets high marks from the tasters. 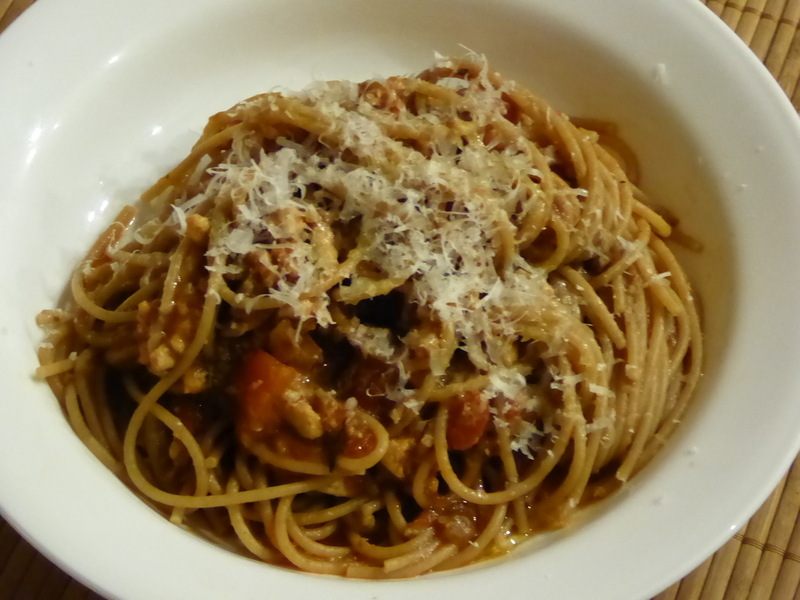 This entry was posted in Poultry and tagged ground turkey, mushrooms, whole wheat pasta. Bookmark the permalink.